Retailers are filing for bankruptcy at an alarming rate that's quickly approaching recessionary levels. It's only April, and nine retailers have already filed for bankruptcy since the start of the year -- as many as all of last year. "2017 will be the year of retail bankruptcies," Corali Lopez-Castro, a bankruptcy lawyer, told Business Insider after she attended a recent distressed-investing conference in Palm Beach, Florida. "Retailers are running out of cash, and the dominoes are starting to fall." Payless ShoeSource, hhgregg, The Limited, RadioShack, BCBG, Wet Seal, Gormans, Eastern Outfitters, and Gander Mountain are among the retailers that have filed for bankruptcy so far this year, and most are closing hundreds of stores as a result. 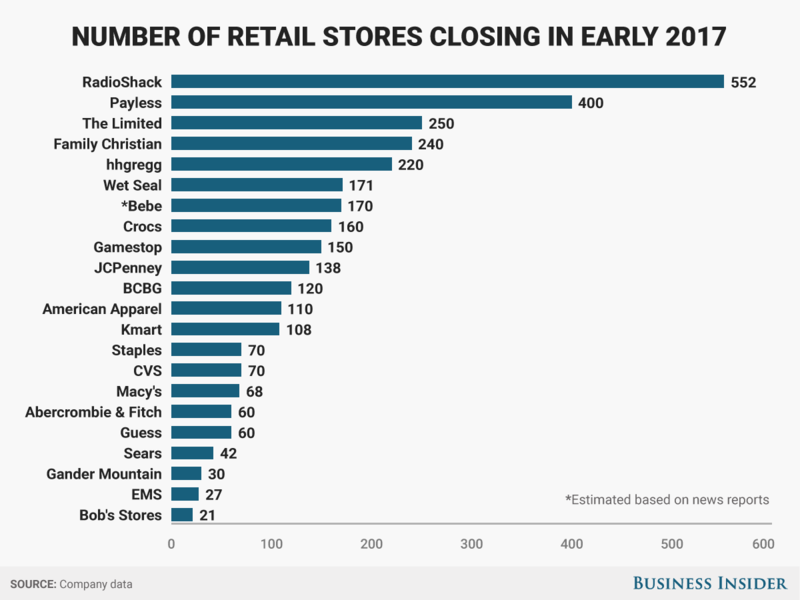 On top of those closures, retailers that are staying in business -- at least for now -- are shutting down a record number of stores. More than 3,500 stores are expected to close over the next several months. Annual retail bankruptcies peaked at a total of 20 in 2008 -- a level that the US could reach by September if the current rate of filings continues, according to CNBC. During the recession, private equity firms and banks came to the rescue of some retailers and brought them out of bankruptcy through restructuring. But there aren't many firms willing to rescue dying retailers these days, according to RBC Capital Markets. "Private-equity firms [and] banks seem less willing now to step in to save these failing retailers as the issues this time around are more structural rather than quick operational fixes," RBC analysts wrote in a recent research note. In other words, shoppers' habits are fundamentally changing, and some retailers just aren't cut out to survive in the new retail environment. Traditional retailers with large fleets of physical stores have been hit the hardest. Visits to shopping malls have been declining for years with the rise of e-commerce and titanic shifts in how shoppers spend their money. Visits declined by 50% between 2010 and 2013, according to the real-estate research firm Cushman & Wakefield. And people are now devoting bigger shares of their wallets to restaurants, travel, and technology than ever before, while spending less on apparel and accessories. Malls across the country are struggling to stay open as stores close in droves. But it's getting increasingly more difficult to find replacements for lost tenants, according to RBC Capital Markets. "Over the last few years, we believe most of the emptied store space has been taken over by expansion of restaurants, entertainment spaces/movie theaters, and health & wellness destinations (hair/nail salons and fitness studios)," analysts wrote. "If store closures continue, we find it harder to imagine there is a solid supply of concepts willing to take over these [locations]."